We wanted to stop at a pizza place we had never tried before. 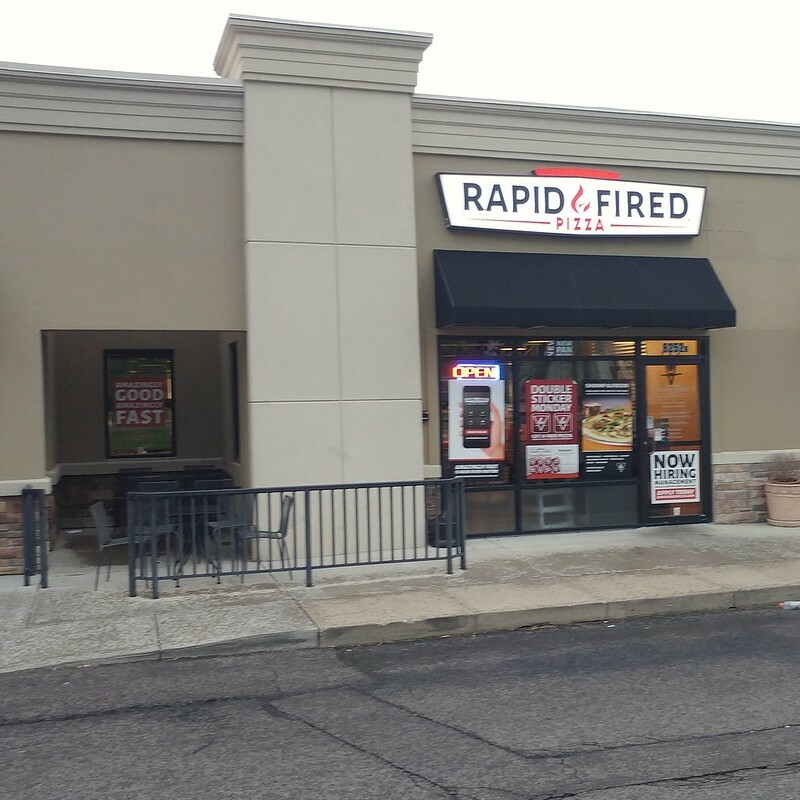 I had gotten a coupon in the mail for Rapid Fired Pizza, so I briefly checked out their website. 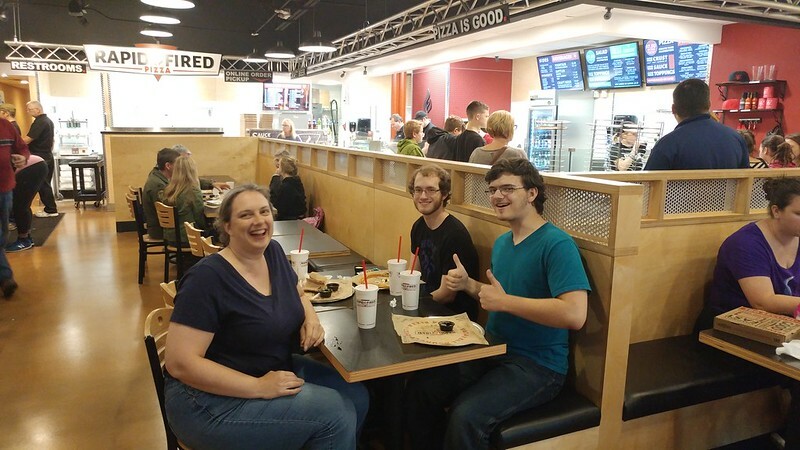 The concept of fast, individually prepared pizzas sounded interesting, so I thought we would try it on a trip to bring our oldest son home from college for the summer. We followed the sign to the counter and picked the 11 inch thin crust. They also had a 9 inch pan crust for the same price ($7.50), but none of us ventured to try that. 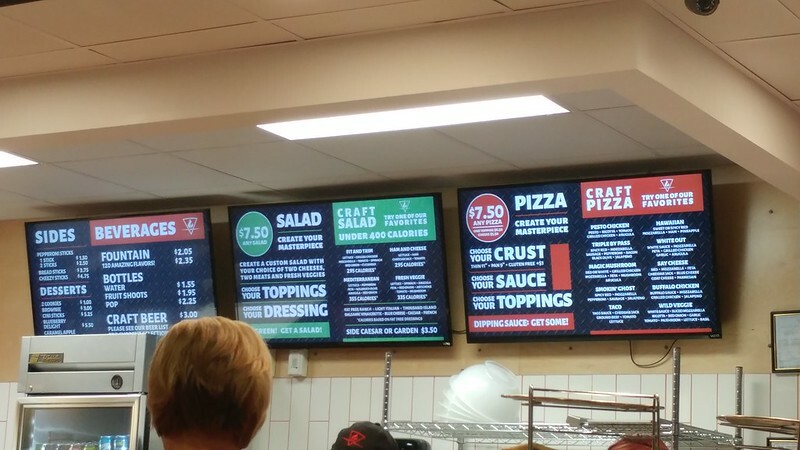 They offered several pre-built flavor combinations or a Build Your Own pizza. Andrew and I built or own, while Steven had the Taco pizza and Katherine the Say Cheese pizza. The pizzas come with unlimited toppings for that price. 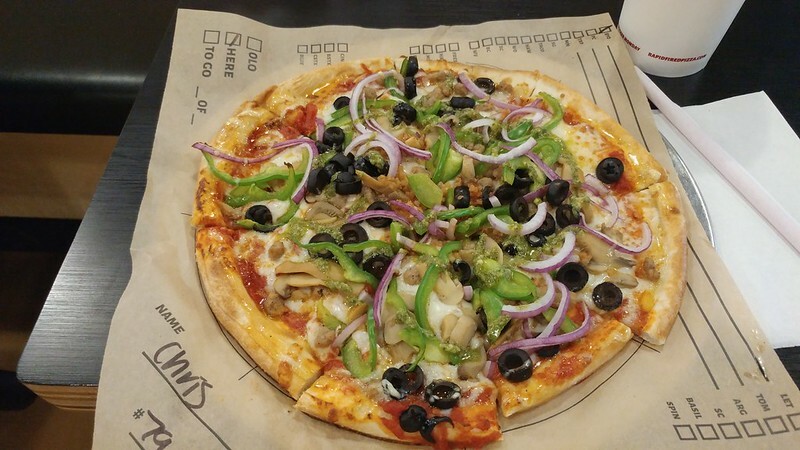 You could get a single topping for $6.50 or a cheese-only pizza for $5.50. The person behind the counter walked down the row of ingredients with me, asking about my desired pizza toppings, similar to an experience at Subway, where you choose what to put on your sandwich. The pizza was then placed into the oven. After I placed my order, the rest of my family had to wait for them to fulfill an online order for 11 pizzas which meant my pizza came out about 10 minutes or more before my son's pizza. I felt that $7.50 for the small, thin, 11-inch pizzas was a little steep. However it was filling. I would have preferred it to be at a $6 price point, considering how small and thin they were (about personal size). However, I assume the price is that way due to the unlimited toppings, which I suppose most customers take advantage of. After receiving your pizza, they have a dipping sauce station with many different squeeze bottles such as pesto, barbeque, creamy garlic, boom boom sauce, etc. I squeezed some of the creamy garlic and the pesto all over the top of my pizza, which had a good flavor effect. The whole family thought the pizza tasted pretty great and thought we might try it again sometime.